Which one is the original? Disgraced South Korean scientist, Dr. Hwang Woo Suk (yes that's his real name) was in New Orleans last night to celebrate the election of one of his creations. 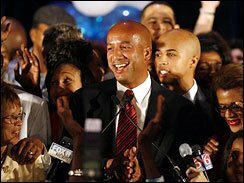 Ray II was narrowly elected Mayor of New Orleans yesterday while Ray (the original) stayed in Houston and watched the outcome on CNN. "I think it's good for my clone to get he feet wet, so to speak, in politics," said Nagin (I) at a press conference. Party insiders said they were originally worried that having two Ray Nagins might confuse voters but later realized they were talking about the residents of Luisiana.